The U.S. Department of Education is about to pilot test a new debit card for students who get federal student loans. For the federal government, it means less hassle and a way to get a glimpse at whether students are spending their student aid wisely. For the bank that gets to issue the card, it means access to a tremendous base of future middle-class clients. 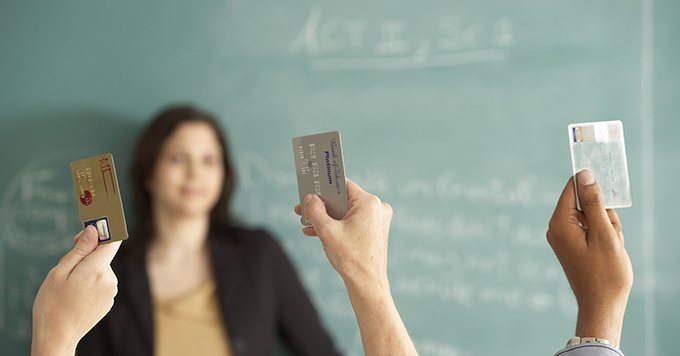 For students, it means potential savings since the card has no fees and prevents students from overdrafts. As a scholar of both payment cards and financial literacy for young adults, I see benefits but also a serious potential downside to the debit card. Let’s look at benefits first. By streamlining schools’ processing of financial aid funds, the administrative costs of distributing approved student aid can be reduced and result in some taxpayer savings. Second, if the federal government uses its bargaining power to reduce – or eliminate – banking fees for students, it will help lower overall college costs. Third, some students may benefit by having restrictions placed on their ability spend more money than they have. But there are also potential downsides. For instance, the federal government and the card-issuing bank could monitor student spending habits in ways that could lead to restrictions on purchases. Banks might also use intimate data on student spending habits to sell them an array of profitable products after they graduate. The federal student loan program is huge. In the last quarter of 2018, 42.9 million peoplecollectively had student debt of US$1.42 trillion. Student loan balances exceed both credit card debt and auto loans and now constitute the largest amount of consumer debt in the U.S. The federal student loan program is also troubled. According to Education Secretary Betsy DeVos, nearly 20 percent of federal student loans are delinquent or in default – seven times the delinquency rate on credit card debt. DeVos and others suggest that part of the problemis that students may not have been given enough information to make informed borrowing decisions. A major function of the Federal Student Aid payment card is to handle the “refund” of funds disbursed through the agency. In this context, a refund is the remaining amount of federal student aid given to a student to help support a semester of college, after tuition and other college fees have been taken. For example, if Makayla’s federal student aid is $10,000 per semester while her tuition and fees are $6,000, Makayla’s refund would equal $4,000. The purpose of the refund is to help pay her other expenses such as books, a computer and personal items. The payment card, which would work like a prepaid debit card, could simplify the payment process by transferring the refund directly from Federal Student Aid to the student, bypassing the need for the college to cut a check or otherwise transfer the refund to the student. The payment card would be convenient for students since a pre-paid debit card would substitute for a checking account. In fact, the payment card is specified to be totally free for students, with no minimum balance requirements. Historically, about half of campus-based banks have charged fees for their accounts that ranged from $1 to 47 annually. With a prepaid debit card, students can spend only the money they have in their account and cannot rack up large fees for insufficient funds since a debit card purchase will be declined if it exceeds the student’s current bank balance. Aside from protecting the lender, this may also force students to budget and live within their means since they cannot incur additional debt by overdrawing their account balances. It may be embarrassing to have one’s debit card declined for insufficient funds, but at least having a debit card declined is not illegal and won’t cause students to get overdraft fees like they would if they wrote a bad check. Along with improving the efficiency of distributing student aid and conditioning future student loan recipients to budget more carefully, the payment card will be a “restricted debit card,” which means that the issuer can restrict certain merchants or types of merchants from receiving payment for their goods and services. In the payment card world, every type of business is given a four-digit Merchant Category Code that describes what they sell. It is possible that bookstores would not be restricted while bars and tattoo parlors could eventually be made off limits. In addition to possible arbitrary, values-based restrictions, constraints can cause problems for “nontraditional students” such as single parents who may need their refunds to pay for rent or day care. It appears that no category restrictions will take place during the pilot phase, which begins in 2019, although they may be possible in the future. Participating banks must provide to Federal Student Aid data on how students collectively are spending their money. It is not difficult to see how this data could be used to limit certain types of purchases in the future. Why would a large bank be willing to take on a new, complex, rules-ridden project with no fees, and unprofitable student customers who tend to carry low balances but do a large number of transactions? First, it gives the bank the opportunity to be the primary financial service provider for millions of college students who in a few years time will likely be middle- or upper-class college graduates with multiple, profitable financial needs over their lives. For many college students, this banking relationship may persevere for many years, particularly since mandatory college loan repayments tie students to the bank that provided their student loan for a decade or more after graduation. There is another, possible, but more insidious motivation for a bank to participate – the acquisition of the student’s financial behavior data which can be used to sell them other bank products, such as credit cards, mortgages, investment accounts and loan consolidations over a lifetime. These valuable data can also be sold to other companies. This benefit to the card-issuing bank is recognized but limited by the U.S. Education Department’s request for proposal, which states that bank use of their student data must be approved by the student loan borrowers themselves each time the bank wishes to use such personal information. The Department of Education, faced with huge operational costs and default rates in its student loan program, deserves credit for its efforts to reduce these costs so that the invaluable aspects of its program can continue. The debit card can be helpful in reducing costs for the government as well as for students who will save money on banking fees. The primary downsides of such a payment card depend on how student loan borrower data are used and how the card might be restricted in the future. In short, the Federal Student Aid payment card will ultimately be seen as a rather small but efficient technological change in the way student financial aid is transmitted. But it will do little, if anything, to lessen the overriding problems caused by unmanageable student loan obligations taken on by many unwitting students.